Is U.S. exploration of space a justified use of taxpayer funds? The Morality and Politics of Justice project was designed to create our own opinions on world issues. It was a great place to start to build our own political and social beliefs. We were required to write three essays, part one was our own views and connections to the topic or subject that we chose to do our project on. Part two was the pro side of our topic. This was written without our own opinions in it; it was just a paper on why that topic is good. Part three was the opposite, it was the cons of our topics. To start this project, we read from The Night Thoreau Spent in Jail and Justice books. This lead into discussions on why people act the way they do, such an example would be why people protest, violently and nonviolently. We also learned about different philosophies that are big parts of how people think. Utilitarianism, Libertarianism, Deontology, and John Rawls's Veil of Justice were the major philosophies we studied. I don’t know how to really write this paragraph, but I can try. I’m sure it’ll start off decent and then go off on another topic that still relates, but isn’t what this paragraph is about. Without further ado, here we go. Major changes that have occurred between drafts of my essays weren’t big. My part one was easy to write quickly. Part two and three were spent just trying to find decent evidence and making sure that they made sense. I wrote an op-ed for my final piece, which was my part two with some tweaks to make it more like an op-ed. I was going to submit it to the Telegraph or the Herald, but I didn’t feel like it was up the same quality that goes into those papers. It will be put onto the Quill’s website though. All my essays did contain good pieces of evidence, so they were well researched, especially parts two and three. What was most challenging for you about this project and/or presenting your perspective at exhibition? What did you learn about yourself in working through this challenge? There were a few challenges that I faced going into the project, but they weren’t big ones. First off, I don’t like politics, so this project wasn’t super engaging for me. I got bored a lot. I didn’t speak up much because my opinions differ and I didn’t want to argue with my peers. I did form some of my own opinions though, which made me actually start to think about certain topics in politics. I know politics are important, but they cause people to fight which isn’t good at all. Another challenge was speaking in front of people, even if it isn’t a large group. For the exhibition, we stayed at our stations and explained our positions on our topics. It’s a pretty easy straight-forward thing to do, but it still stressed me out. It was a regular exhibition, so I couldn’t stress too much. Plus being in a pretty lax location helped. I just wasn’t sure how to put my point across and I feel like I messed up on a lot of what I was saying. This is gonna be a mix of multiple questions. Now that you have looked at both sides more deeply, how and why has your perspective shifted? Is there a middle ground or room for compromise based on your understanding of the perspectives on the pro and con side? After completing parts 1 – 3, have you changed how you see people you strongly disagree with? My perspective hasn’t really changed much, but I do see the other side’s perspective on space travel. 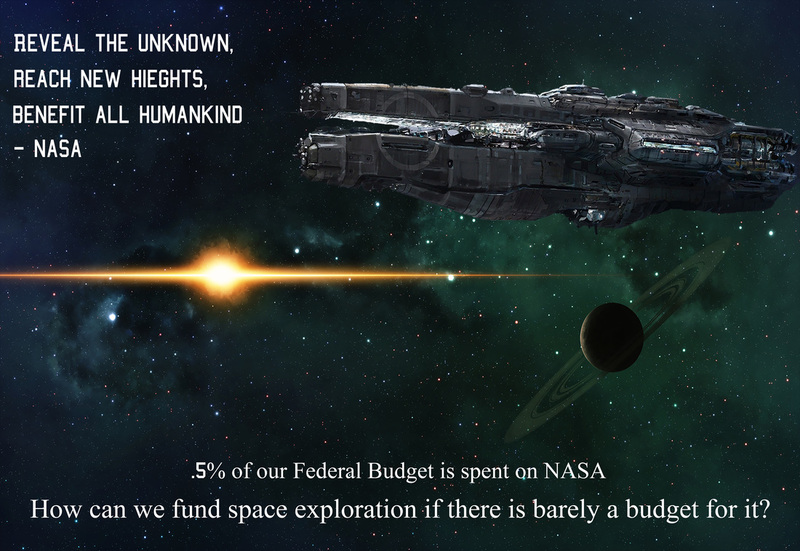 I’ve changed my argument from just getting started on space travel right away, to let’s finish exploring Earth before we get going on space, but we can still put more funding into it right now. I’m on my side because I love the past, and I’ve grown up with space. Learning about it, watching movies that have outerspace in them, and just thinking about it. No matter what people tell me about the other side, I will always be curious about space and wanting to go there. It’s huge and terrifying and amazing and so interesting. I understand everyone’s opinions on this topic. It’s not a hard one to see both sides. My thoughts on the opposing side’s views haven’t changed, so much as they have evolved. I learned more about that side which I respect.